Hello friends! Hope you've had a good week...mine's been a very busy one. Here it is Saturday again and the last Saturday of March...where has this month gone? It's time for another chance to play along with The Sweet Stop sketch! I just had to use one of the new images being released this week at Sweet 'n Sassy Stamps...it fit the sketch perfectly! Please note the information for the release hop and party on my side bar. There are six wonderful new sets and some dies being released, so you won't want to miss out on all the fun! Creative Nugget: Here is a Sweet Peek of a new clear stamp set being released this Thursday at Sweet 'n Sassy Stamps called, "Treasured." I LOVED coloring this image. I did a Google search for monarch butterfly images and found a picture that was almost exactly like the stamp, grabbed my copics, and began to color away. Since this image screams to be showcased, most of the other elements of the sketch were kept white to let the flower and butterfly pop! Doilies seemed the perfect solution for the circle panels...some dark red patterned paper was used to back the doily to let some of the red color peek through. The doilies and all the layers were sponged with Walnut Stain Distress Ink. A photo corner punch was used to create the sentiment tag. Some piercing and a few buttons with pearl accents finished the card! I didn't get a chance to make a Christmas version this week as I'm busy creating Easter cards. Hopefully, I'll have another one next week! Don't forget to stop by the blogs of the other Sugar Babies to see more fabulous inspiration. I hope you have a fabulous weekend and get a chance to play along with us this week! Hello friends! Don't you just love Spring? We've had such a glorious week here...wonderful weather, birds chirping, flowers blooming, time to create! Saturday has come again and that means it's time for another challenge at The Sweet Stop! Inspirational Nugget: Spring...what a perfect picture of how God works in our lives. He takes the dormant, barren, winter times of our lives and brings forth new growth and a fresh outlook...Sorrow may endure for a night, but joy comes in the morning! (Psalm 30:5) Praise the Lord! My sample for today was made with Spring in mind! Creative Nugget: Hearing the birds chirping outside my crafting place caused me to reach for this adorable clear stamp set by Sweet 'n Sassy Stamps, "One of a Kind." I followed the sketch for this week pretty closely. The image is colored with copic markers, cut out, and adhered to an oval nestie sponged with some clouds. 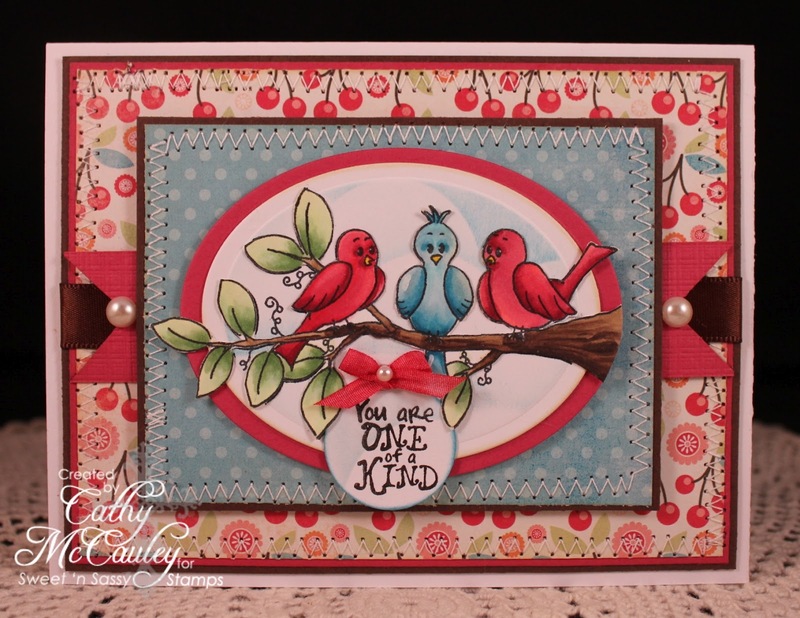 The colors were inspired by Bridget's "Hump Day" challenge on the Sweet 'n Sassy Stamps Forum at SCS which was to use aqua and red. My aqua was more turquoise, but I really liked this combination...it's so cheerful! The patterned paper was by My Mind's Eye and was perfect for the sketch and color challenge! All of the samples by the Sugar Babies this week are fabulous...aren't they always! Be sure to stop by and see all of them! I hope you have a chance to enjoy Spring wherever you are this weekend, and can find some stamping time to capture a bit of Spring! Thanks for stopping by for a visit! Hello stampin' friends! We've been enjoying some wonderful weather here...it's beginning to feel a lot like spring! The daffodils are blooming and the buds on the magnolia tree are close to opening! Hope you've had a pleasant week as well! It's Saturday and that means it's time for some stamping fun at The Sweet Stop. Since it's the third Saturday of the month, today's sketch has a spin..."Show me your GREEN." I hope you'll decide to play along because a $15 prize for Sweet 'n Sassy Stamps will be awarded to one lucky participant. With that being said, green happens to be my favorite color! I have to admit though, that I struggled with this sample...couldn't seem to find the right papers or image to fit the sketch...has that ever happened to you? I did take some liberties with the sketch this week, something I don't usually do. All in all, I do like the end result! CMC Copic Challenge #39, open until March 30th, is "Anything Goes," so I will be entering this card in that contest as well! Creative Nugget: This adorable digital image, "Spring Bringer," is from Wee Stamps and was colored with copic markers. A curvy rectangle nestie was used to cut her out...not the square called for in the sketch. The papers for each panel are from the Sweet Threads paper pad by BasicGrey and mounted on an old retired SU! color...Forest Foliage. Everything was stitched to a Wild Wasabi card base. 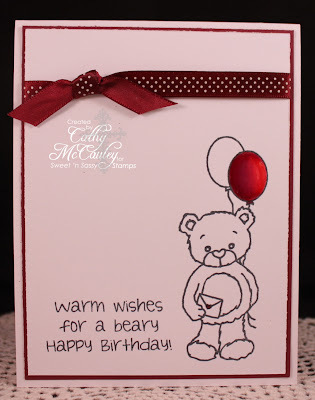 A classic ric rac edgeability, some ribbon, pearls, and a little layered flower were added to finish the card. The sentiment, from the Rose Collage clear stamp set by Sweet 'n Sassy Stamps, was switched from the right side to the left...it just seemed to fit better there. Some stickles was also added to this little sprite's wings! Be sure to stop by the other Sugar Babies for some wonderful inspiration and have fun with the sketch! Be sure to use the linky tool at The Sweet Stop to upload your sample to be eligible for the prize! Hello friends! We've been having such beautiful weather here...it's hard to believe it's "Hump Day" already! 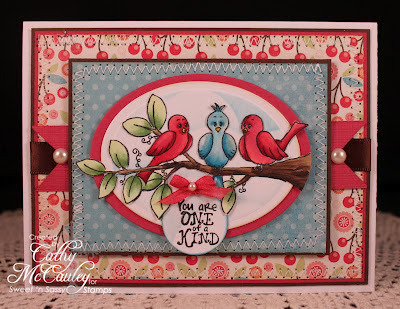 That means it's time for another "Hump Day Challenge" on the Sweet 'n Sassy Stamps forum over at Splitcoaststampers and yours truly is the host, so I hope you'll join us later this morning! The challenge today is to use Kraft card stock. Kraft looks great with whatever color you pair it with and is a fabulous neutral color to work with! 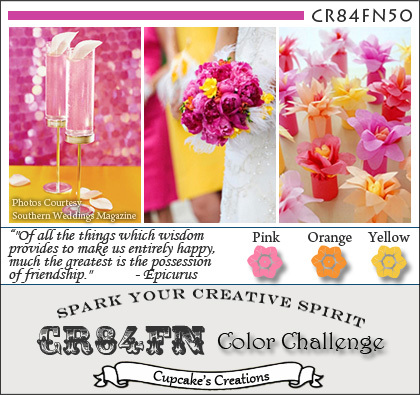 The colors in my sample were inspired by the current CR84FN50 Challenge. 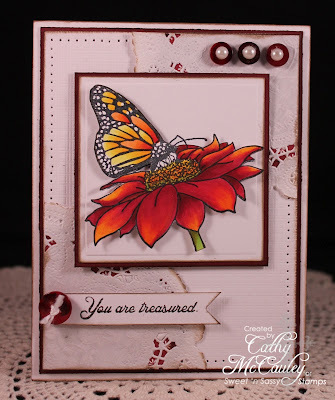 Creative Nugget: The focal image is from the beautiful Flowers in Bloom clear stamp set from Sweet 'n Sassy Stamps. It was stamped with VersaMark ink and embossed with Detail White EP. I wasn't sure how my copics would react to the embossing powder, so I grabbed my Prismacolor Pencils and Gamsol which haven't seen the light of day in ages! I liked how vibrant the colors looked on the Kraft card stock. The edges were sponged with Broken China and Peeled Paint Distress inks. The image was cut and layered onto a scalloped oval Nestie and then onto a distressed doily. The Kraft DP is by BasicGrey and was stitched to True Black which was stitched to Select White and adhered to a Kraft card base. To complete the card, lace, ribbon, a rhinestone flourish, pearls, and a little punched butterfly were added! My next card is a CASE! Harriet was the Featured Stamper on Splitcoaststampers this past Sunday, and she truly is the Queen of Clean! I am NOT good at clean and simple cards, so I love to CASE those who are. 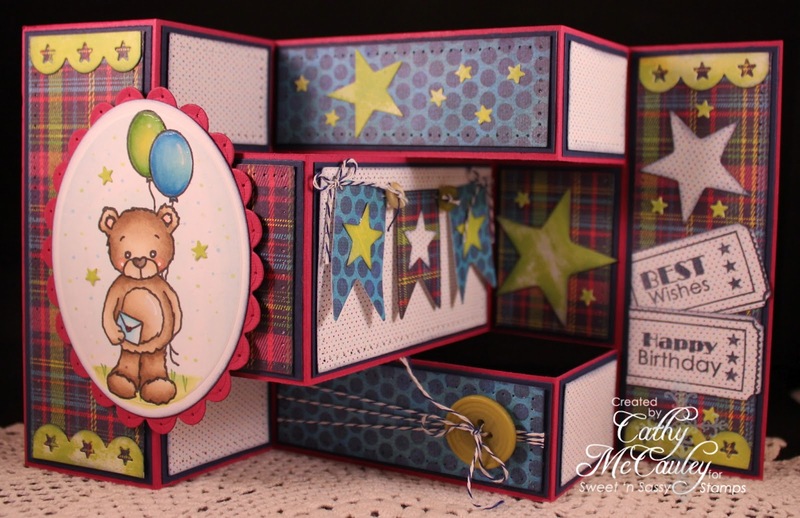 Harriet's Way to Use Buttons card is HERE and Her wonderful gallery can be found HERE! Creative Nugget: This card literally took only fifteen minutes to complete...a definite record for me! I love just the one red colored balloon covered in Glossy Accents! What do you think? I hope you've found some Inkspiration today! Thanks so much for taking the time to stop by for a visit! I appreciate it! Happy Saturday stamping friends! It's time for another fabulous sketch at The Sweet Stop! I love layers and Korin's sketches always provide plenty of opportunity to lay on the layers! Creative Nugget: If you love stamping flowers, you will love Flowers in Bloom, a clear stamp set by Sweet 'n Sassy Stamps. Although this is not a new set in the Sweet 'n Sassy line of stamps, it is new for me, and I found myself reaching for it to use with this sketch. A stamp positioner was used to repeatedly stamp the image across the main panel. The flowers and butterflies were colored with copic markers. The panel was sponged with Antique Linen, Broken China, and Peeled Paint Distress Inks and layered onto True Black...I can't get enough of my black card stock! A piece of patterned paper was zig-zag stitched to a True Black layer. Some vintage cream card stock was embossed with the square lattice folder and sponged with Peeled Paint. This panel was zig-zag stitched to another piece of True Black. 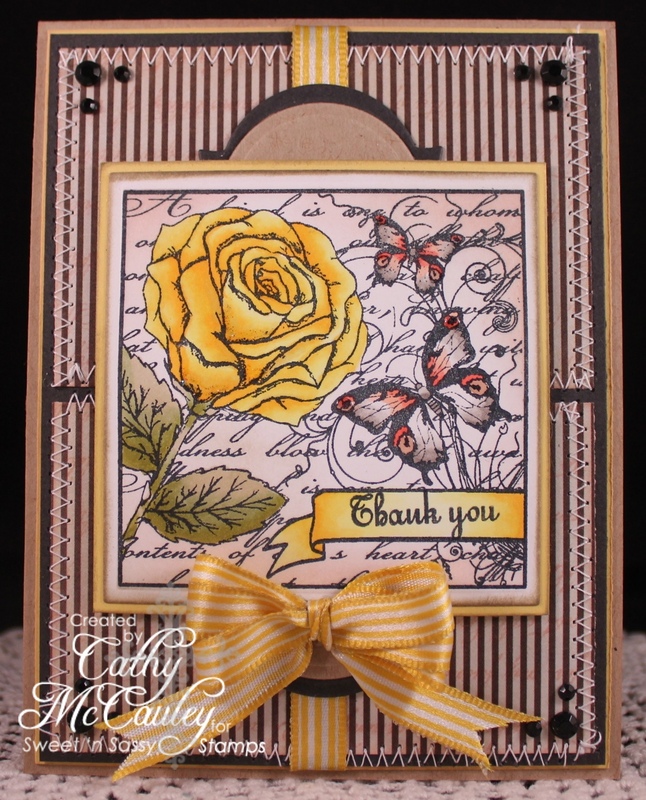 Everything was layered onto an Autumn Rose card base. 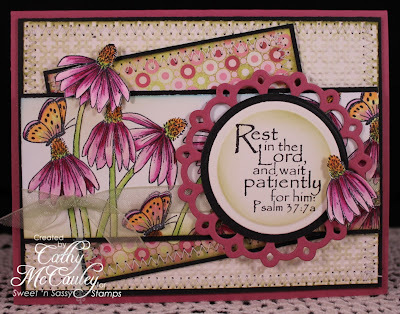 The verse from Psalms is from the Wait on the Lord clear stamp set. 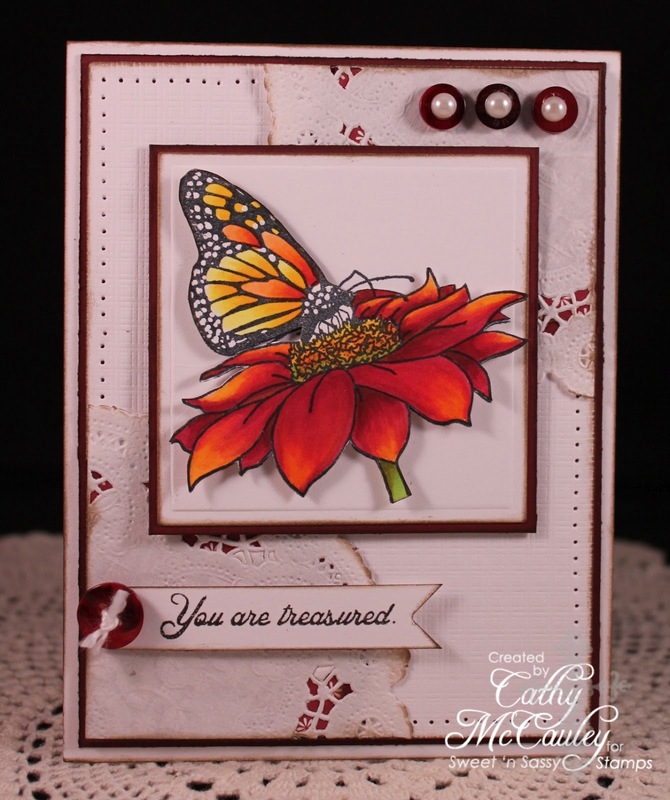 It was stamped and cut with a circle Nestie and layered onto an Autumn Rose Picot Edge Circle die cut. Celery organdy ribbon was tied around the main panel and several additional flowers and a butterfly were popped up for dimension. 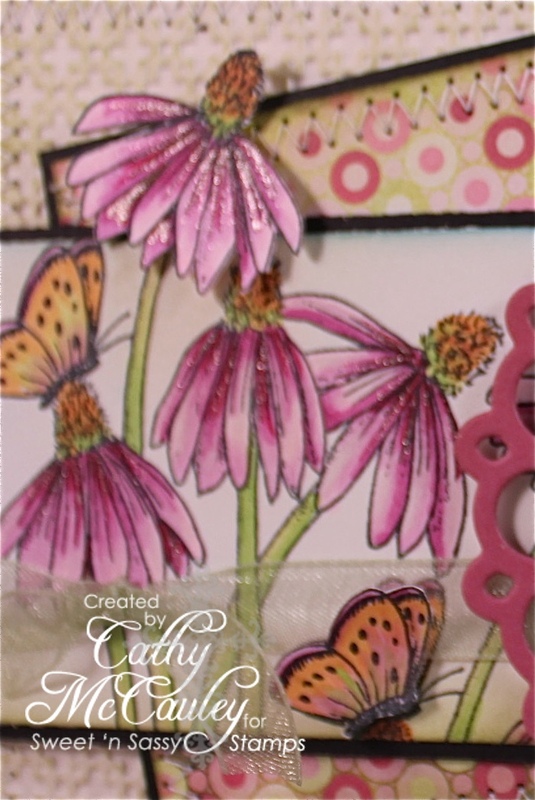 A Rose Star Jelly Roll Pen was used to create some sparkle on the coneflowers. It's hard to see on the main photo, but you can get a better idea from this close-up. That finished off this card! You'll get plenty of fabulous inspiration as you visit the other Sugar Babies. Hope you'll give this sketch a try! We love to see your creations! Thanks for stopping by...have a wonderful weekend! Hello stamping friends...happy Friday! I have a very quick post to share with you today. Do you find yourself reaching for the same colors when making your cards? I know I do...especially those pinks and greens. That's why I love color challenges...they stretch me out of my comfort zone. I discovered a new color challenge site that I will be visiting again for inspiration... CR84FN. 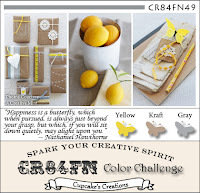 The colors this week were Kraft, Yellow, and Gray...a combination I would have never put together on my own. 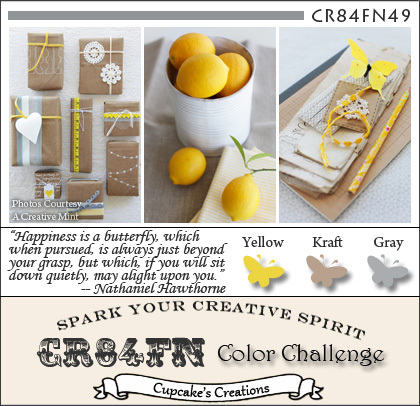 Here is my CR84FN49 sample card. Creative Nugget: Sweet 'n Sassy's beautiful Rose Collage clear stamp set was used for the focal image...LOVE! The image was colored with copic markers and die cut with a square nestie. A Labels Twenty die was cut from Kraft and Black. These were cut in half and layered so that they framed the top and bottom of the main panel. The striped DP was cut into fourths and layered on Black, Lemon Tart, and a Kraft card base. Stitching, pearls, and some yellow striped ribbon from my stash were added to complete the card. Look around the blogosphere for colors that will stretch you and give those combinations a try...you might just love the results! Have a grand day! Thanks for stopping by! Hello everyone...happy Thursday to you! It's to be a glorious day here today...very spring-like with the temperature getting close to 70! I plan to get out and enjoy it, but first I have some wonderful news and a card to share with you. I was so surprised to learn that I had been Liebstered by my very sweet Sugar Baby friend, Shannon! I am sorry to say that I had no idea what that meant until I read her blog. Now that I know what it means, I feel very honored...Thank you so much, Shannon, for thinking of me! If you don't know what the Liebster Award is...here's the scoop! This award is for bloggers with less than 200 followers, to bring attention to their blog, and increase their following! So, in the spirit of good fun I am passing this award on to five worthy bloggers. Please stop by to visit them, and become a Follower. The five blogs I have chosen are listed below. Click on over to their beautiful sites, look around and don't forget to become a Follower! And now...to share my card! The Ways to Use It Challenge over at Splitcoaststampers today is "Boys and Their Toys" and boy was this a tough one for me! I have a hard time coming up with masculine cards. Mo Manning came to the rescue with this Video Boy digital image...my nephews all LOVE video games! Creative Nugget: This image was so much fun to color with my copics! I tried to give the jeans a stonewashed look, so after coloring and shading them, I got the colorless blender and started dabbing away! 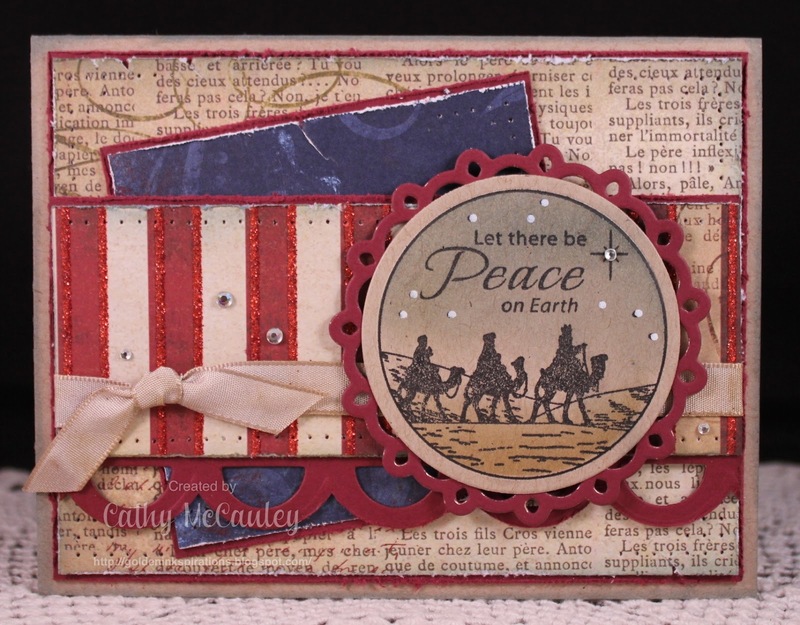 The image was then cut using the Labels two dies by Spellbinders and layered onto Night of Navy card stock. The sketch was suggested by Mo's Digital Challenge for last week. The patterned papers used are by Echo Park and the Pure Poppy borders along the side were cut with the scalloped Edgeabilities dies. The little tag was cut with the Pennants and More Die Set and stamped with Ticket Sentiments, both by Sweet 'n Sassy Stamps. I will be using this card for my nephews birthday...hope he likes it! Thanks so much for stopping by today...hope you get a chance to get out and enjoy the sunshine! Hello Friends! I hope you had wonderful weekend! 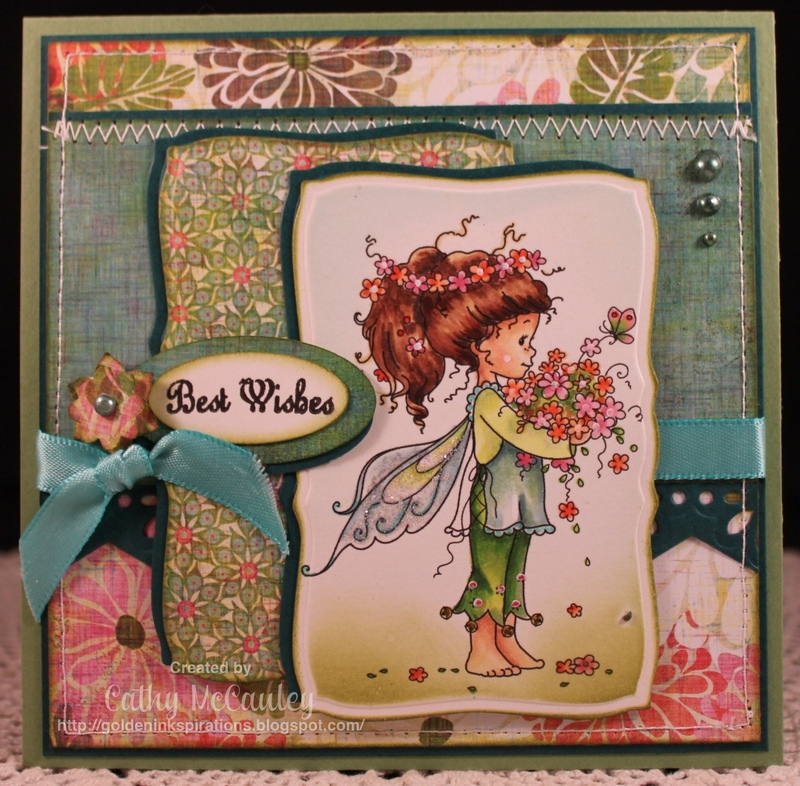 It's my day to post on the Sweet 'n Sassy Stamps Blog, so I thought I would share that post here. 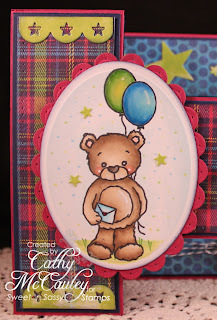 I LOVE new releases and last Thursday Sweet 'n Sassy Stamps released six fabulous new clear stamp sets PLUS matching dies, so today I decided to celebrate...with that most adorable bear...Rhubarb! 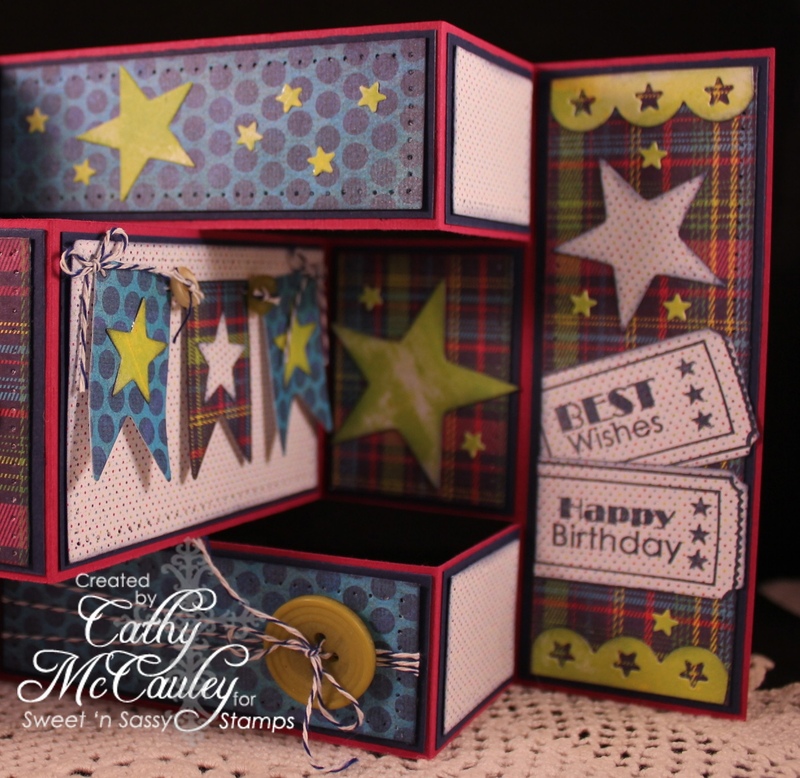 The card I made for today is a Tri-Shutter Card and the tutorial for this fancy fold can be found over at Splitcoaststampers under the resources tab. Creative Nugget: The front of the card features Rhubarb from the new Rhubarb's Birthday Wish clear stamp set. Rhubarb is colored with copic markers and the balloons were given a coat of Glossy Accents. The patterned paper is from the BasicGrey Lauderdale Paper Pad. Do you see those stars and the star border? The Stars Die Set has four different sizes of stars and the star border is included in the Hearts & Stars Scallop Border Die Set! Can I just tell you how much I LOVE Sweet 'n Sassy dies...they cut like butter! And here's the whole card opened up. 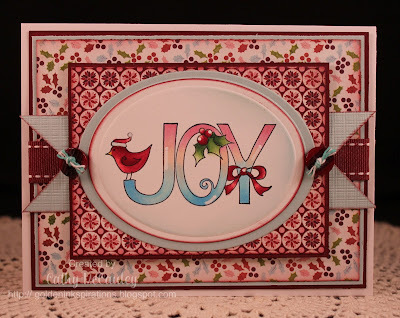 I had so much fun decorating this card with some of my new stamps and dies. I hope I've inspired you to check out the new release at the Sweet 'n Sassy Stamps Store and to try a Tri-Shutter card of your own! This is the day that the Lord has made, let us be glad and rejoice in it...and maybe find some time to do some stamping! Have a wonderful day! Thanks for stopping by! What a busy, busy week! Sweet 'n Sassy Stamps just had another fabulous release...six new stamp sets and a matching set of dies! I LOVE them all, but especially the Vintage Postcard clear stamp set. If you have not had a chance to check them out, head on over to the store, where there are some special deals going on, to take a look. I'm sure you will be adding some of these sets to your wish list! With that in mind...I decided to feature my favorite set of the release for my Saturday sketch from The Sweet Stop! Creative Nugget: This sketch was perfect for achieving a kind of vintage look. The papers, colors, and accents helped produce the look I was trying for. The top panel was created by stamping some of the elements from the Vintage Postcard set right on the patterned paper in Basic Gray and Pumice Stone Distress inks. The little first class friend post mark was cut out with one of the matching dies. The second panel was made the same way using the Friendship Script background stamp set, another new release. These were layered on My Mind's Eye papers from the Portobello Road paper pad and a Soft Stone card base. 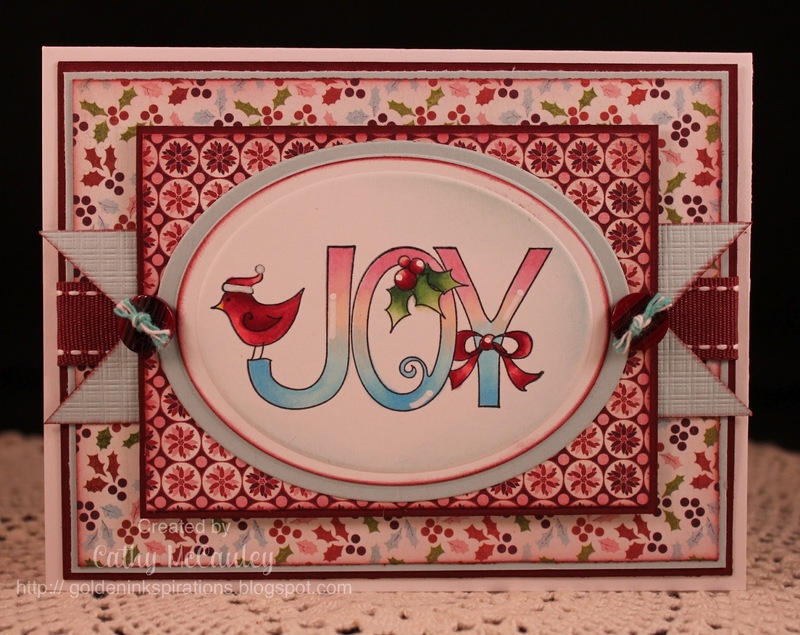 The dotted panel was zig-zag stitched to the Heart Border, which is also a die from Sweet 'n Sassy Stamps. Finally came the addition of the rolled flower made from two cuts of DP using the Spiral Blossom 2 die from Spellbinders. My first attempt at a rolled flower is a bit over-worked and not as tight in the center as I would like, but looks okay...I think! Some Stardust Stickles was brushed on the flower petals and the whole flower given a shot of Tattered Angels Glimmer Mist to finish it off! You can scroll down to my last post to see another card made with this fabulous set! I didn't get a Christmas version done yet...busy, busy, week...but this is such a great sketch, that I plan on doing one, so be sure to check back! 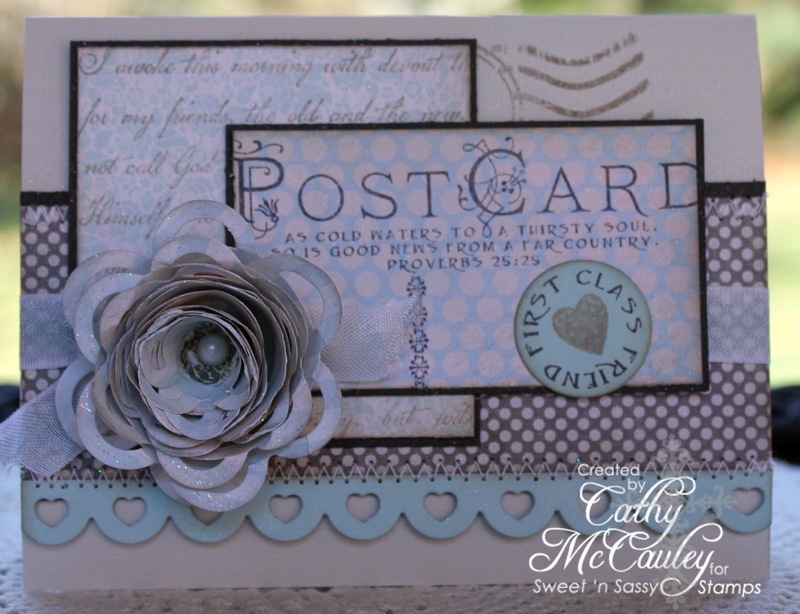 Before you leave, check out the very talented Sugar Babies for more inspiration and then join us at The Sweet Stop this week for some fun stamping! I appreciate so much the time you take to stop by...thanks so much! Have a wonderful weekend!